The Centinera Beach is located in the village of Banjole in a pine forest, providing shade to all the guests who want to hide from the judge. The beach is partly pebbly and partly rocky. It is ideal for children because it has plenty of shallow parts. From the beach you can rent boats, deck chairs, umbrellas, bicycles for water, a small water park for children and a gastronomic offer there are several restaurants and bars nearby. In the season there are also animators who animate guests free of charge several times a day. Nearby is the popular beach Paltana Banjole.Plaza is adapted for children and is a great place for families because of the rich offerings for children, a multitude of water activities and the gentle entrances to the sea. Parking is free. The disadvantage is too much mood in the heart of the season. 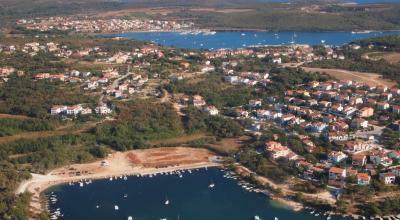 Nearby are the Arena of India, the Peškera campsite and the Diana Camp.